A festival within a festival, nine artists painted the pillars below the DVP / Gardiner Ramps at the mouth of the Don River and, the CN Rail Bridge at Don Landing. The river-side murals are inspired by the resilience of the Don River and explore the ecological challenges and opportunities faced in renewing our relationship to this urban watershed. This project was commissioned by Friends of the PanAm Path and their celebrated partners. Their pillar focuses on the connection fishermen have to these fresh water resources and reintroducing salmon into the river. While mixing paint using water from the Don River, Patrick (the P in PA System) had a drop of water hit his lip. Within an hour his throat closed and his eyes became red and rashly. The current state of the Don is an example of decades of abuse due to human impact such as industrial pollution. These waterways are critical to the health of the people, species and habitats that live along them. Let's hope that through community educational efforts such as Love Letter Projects that one day the Don River and other fresh water sources like it will run clean and healthy as they were intended to. Patrick recovered well, but WTF?! Rajni's mural focuses on a hopeful healthy rebirth of the Don River as the result of decades of destructive human impact such as pollution and plastics. Kirsten's mural focuses on native wildflowers that grow along the banks of the Don River. The habitat the flowers call home are threatened due to human impacts of pollution and introduction of harmful invasive species. 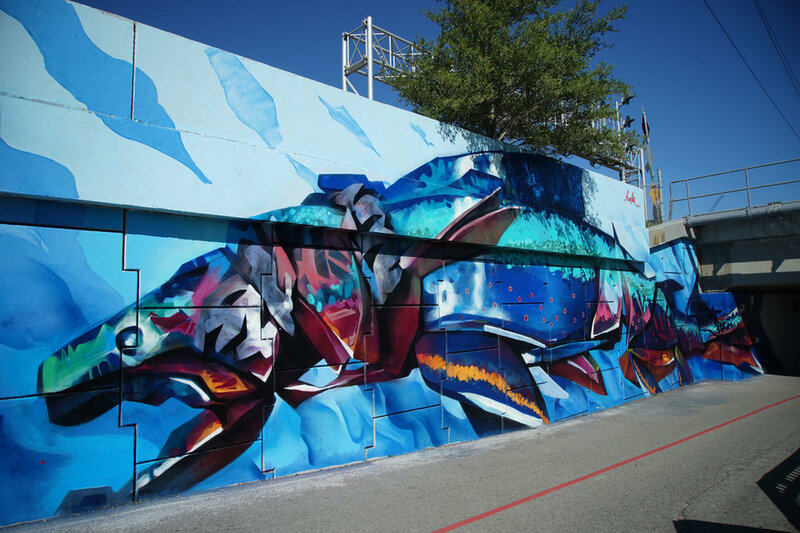 Jason's mural focuses on a hopeful healthy rebirth of the Don River as the result of decades of destructive human impact such as pollution and plastics. 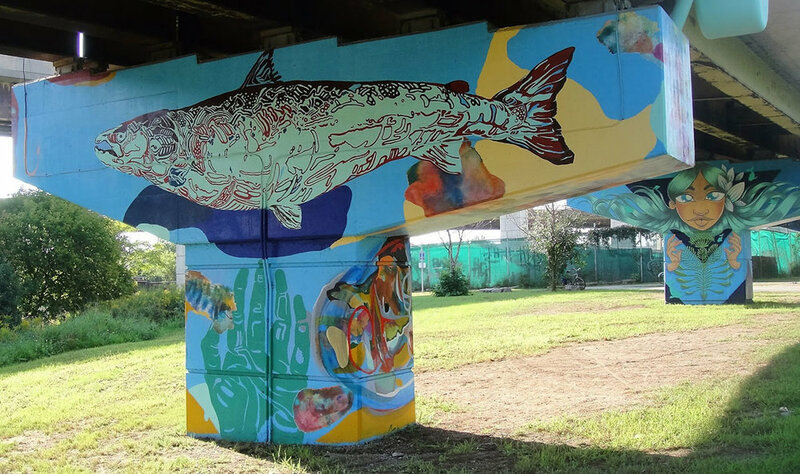 MC Baldassari's mural at the lower Don River trail depicts the balance of nature. She got inspired by the Great Lakes Coastal Wetlands Consortium. The main character is a "protectrice" goddess, the mother of the Great Lakes. "She’s protecting the plants between her hands, as we should protect fresh water sources around the world." Focusing on disappearing native species due to destructive human impact, EGR looks to bring humanity and empathy to how we interact with nature.